Ashly Perez started out as an intern at BuzzFeed. 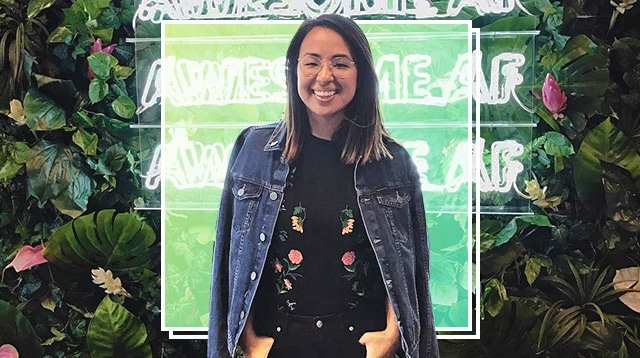 We’re pretty sure you already know her as that quirky part-Pinay girl featured in some of BuzzFeed’s viral videos, but did you know that Ashly Perez had 19 different jobs before landing a spot at one of the leading independent digital media companies in the world? Oh, and she lived in South Korea for a year too! Aside from churning out digital content for BuzzFeed Violet, Ashly is also a proud LGBTQ+ advocate. And she’s starred in a girl-powered sitcom called Unfortunately Ashly, a spawn of her #YouDoYou web series. Cosmo.ph got in touch with Ashly to talk about what her life is like as one of BuzzFeed's Senior Content Producers. How did you end up working at BuzzFeed? I was actually living in South Korea finishing up a job teaching English for a year when a post I wrote for BuzzFeed’s community site went viral. I had applied to BuzzFeed a few months prior, and hadn't heard back, but after that post went viral, they actually contacted me and asked if I would want to join their editorial fellowship. I moved to New York just two weeks after that happened! What’s one video you produced/starred in that you will never forget? “Things Beyoncé Does That Would Be Awkward If You Did Them”! It's one of the silliest videos I've ever done, but also one of my favorites. To me, it encapsulates the joy and silliness of the internet. I had 19 different jobs before BuzzFeed, ranging from frozen yogurt topping scooper to camp counselor to office manager at my dad’s dental practice. I went to school to be a diplomat, and now I make YouTube videos—life is really weird sometimes. I think all of my jobs prepared me for BuzzFeed in one way or another, but honestly, I think the one that helped the most was being a camp counselor. In a lot of ways, I feel like the internet’s camp counselor. What’s a normal working day like for you? Working at BuzzFeed is an ever-changing, non-stop job, which is why I love it. On any given day, I can be in pre-production (writing, looking for locations,etc), production (actual shooting), or post-production (editing and packaging videos) and all surrounded by some of my best friends. So it's a pretty sweet gig. What’s something most people don’t know about your job? Most people don’t realize that I’m not just on-screen talent. In terms of entertainment, my job is closer to what Shonda Rhimes does than Kerry Washington (with all due respect to both amazing ladies.) I’m not a trained actor. I’m actually not a trained anything when it comes to entertainment, but my job is similar to a showrunner’s in that I think of show ideas, produce them, and make sure everything’s working. How do you explain your job in digital media to your parents? Haha, my family consists of doctors, nurses, lawyers, and convert violinists so I understand this dilemma. My family loves what I do, but doesn’t necessarily understand it fully, which is fine. I’m just thankful that my parents never told me what to do, or to do a job just for money; they always told me to do what I loved and the money would come later. Are there a lot of Filipinos working at BuzzFeed? Yes! BuzzFeed is full of diverse people overall. I love working at a company where no one person has to represent the views of their entire group. So if you’re gay or Asian, you don’t feel like you have to constantly be speaking on behalf of your identities. Is there a specific skill set needed to become an actor or producer for BuzzFeed? People here come from all different backgrounds. Some went to film or journalism school and others didn’t. What separates the good from the best is passion and curiosity, so it’s not 100 percent necessary to have studied filmmaking or journalism to work here. Does BuzzFeed have an internship program? Yes, that’s how I got my job. 80 percent of the people you know and recognize at BuzzFeed started as interns. What advice can you give aspiring actors or producers? Go for it and start making stuff today. You don’t have to be a professional to be successful, you just have to keep going until something hits! What’s one project you really, really want to do in the future? I’d love to do a full-blown TV show one day and get to direct a movie, but right now, I’m very content to be one of the many people making things for the internet.